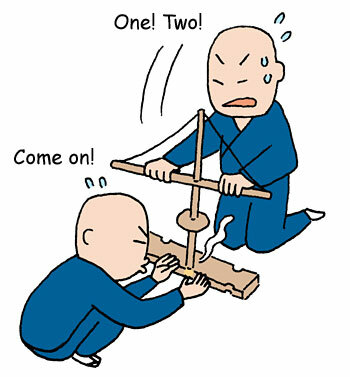 TRIVIA of Noh : Q32 : How do they start the torchlights used for outdoor performances? | Home | Trivia | Q32 : How do they start the torchlights used for outdoor performances? How do they start the torchlights used for outdoor performances? In outdoor Noh performances, or takigi-noh, flickering light of torchlights generates a significant dramatic effect. The torchlight is, however, not mere lighting equipment. Takigi-nō performed in the precincts of a shrine or a temple is itself a ritual or religious service. Before starting the performance, an igniting ceremony is performed by the priests. They ignite the fires with a torch, lit via human power. They make a fire with frictional heat generated by an ancient firing device called “rokuro-hikiri.” The fire grows little by little, first burning small pieces of wood, to which are then added paper, and eventually chips of wood. It burns brightly when put on a torch. Takigi-noh ends when the torchlights are extinguished and the stage fades into darkness. You can enjoy experiencing how a fire transforms itself. Together with the performance, you will have an invaluable once-in-a-lifetime experience that will never recur.